The world’s most successful and best selling soprano Sarah Brightman will unveil her much anticipated fifteenth full-length album, HYMN, on November 9, 2018 (Decca Gold/ Universal Music Group). This marks the multi-platinum, GRAMMY® award-nominated, classical crossover pioneer’s first new studio recording since she released the international chart-topper Dreamchaser in 2013. 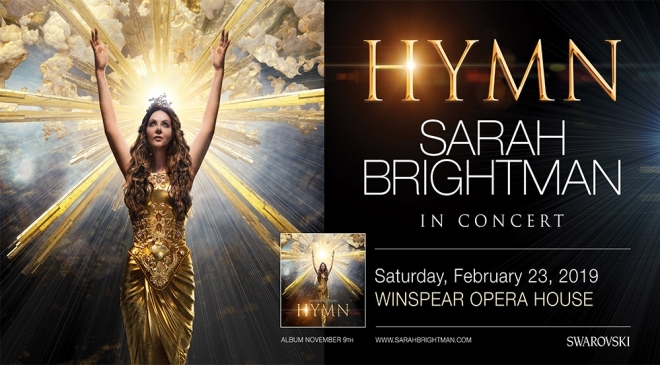 In addition to her new album, Sarah Brightman announced her world tour, Hymn: Sarah Brightman In Concert, which will begin in South America in November 2018 and include 125 shows across five continents throughout 2019. Click here to read all package terms & conditions before purchasing.